Properties in Rangsdorf Station average 4.4 out of 5 stars. Property 18: TOP location with parking near Kudamm-FEWO EXCLUSIVE -from renovated! Property 22: Bergmann apartment in Kreuzberg with WiFi. Property 26: You do not have a suitcase in Berlin? 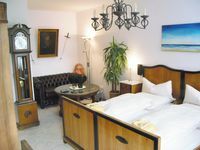 Spacious Uhland apartment in Wilmersdorf with WiFi, balcony & lift. Property 35: Spacious Uhland apartment in Wilmersdorf with WiFi, balcony & lift. My husband and I stayed here for two nights earlier this week. Location was fantastic and the apt was very clean. Very easy to access the S and U Bahn and close to a supermarket to get food. The apt is small but it was all we needed. It was a good price for how long we were in Berlin. Large windows allow lots of natural light and the old furniture gave the space some lovely character. Ronald was a very good host and was there to show us around and answer our questions upon arrival. Also he replied to emails quickly the week of your travel. Only thing was it&rsquo;s on a very busy street and traffic was loud at night so hard to sleep. Amenities in the washroom like soap would be good to have so guests don&rsquo;t have to go out and buy themselves. Overall we had a lovely stay, wish we could have stayed a bit longer. All things being said, it was an excellent experience. The only downside, and this was our fault as well was a slightly clumsy key hand-off. (I may have given the impression that I spoke german well due to my use of Google Translate). The upsides - location wise: 1. An upscale neighborhood where we felt perfectly safe. 2. Stores, restaurants, and services (including the cleanest, best maintained, and easiest to use laundromat I've overseen) are all close by. 3. Transit is close by including S-Bahn, U-Bahn, and busses. With the Google maps app was able to get anywhere easy. 4. Things were quiet with respect to traffic, parties (none), and construction (little in the area - but given how much construction is going on in Berlin, that might change). 5. If you like high-end shopping, this is your place! The upsides - the apartment: 1. This was the quietest place I've ever stayed in. Maybe neighbors were away, but in any event, it was total silence once we were inside. 2. Temperature never got above 5 C during the seven days we were there. But inside the radiant heating kept the place nice and cozy. (Didn't see any air conditioning - maybe an issue in a heat wave.) 3. Everything worked well. (Door lock was a challenge the first day - jet lag making things more difficult.) 4. Clean as a whistle and well appointed. I would recommend this place - but you do need to be able to handle stairs - helpful in keeping the added &quot;beer weight&quot; down.